Before planting rosemary, you'll need to determine if you want to grow it in the ground or in a container. 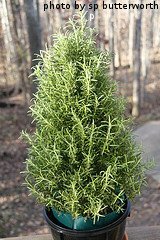 If you live in a cooler climate with harsh winter weather and extended periods of freezing temperatures, you'll want to grow rosemary in a container. This way, the container can be brought inside during cold weather periods. If you live in a warm climate, you can grow rosemary in a container or in the ground. Rosemary is best planted using seedlings. You can purchase seedlings or grow your own from seed. If you are interested in growing one or two rosemary plants, you'll probably be better off purchasing a couple of seedlings. If you live in a warm climate and want to plant a rosemary hedge with many plants, it would probably be cheaper to grow your own seedlings. To grow your own seedlings, start the seeds in flats or small containers 6 weeks before the last expected frost in your area. Fill the containers with potting soil and press a seed into the soil. Water them in well and keep the soil moist by continuing to water a couple of times a week. Place the containers in a warm, sunny location. When the seedlings are a few inches tall, they are ready for transplant into the ground or into a larger container. 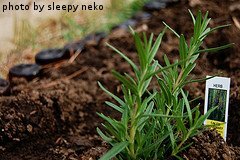 When planting rosemary seedlings in the ground, make sure you choose a spot that gets at least 4-6 hours of sunlight per day. Also make sure the soil is loose any airy to a depth of at least 8 inches. Rosemary does best in soil that drains well. If you have dense soil, work some compost or other organic matter into the soil to help with drainage. Use a trowel to dig a small hole. Carefully remove the seedling from the container and place it in the hole. Back-fill with dirt and tamp it down lightly around the plant. After transplanting rosemary, water the seedling in well. If you are planting more than one rosemary plant, space them 3 feet apart. If you are growing rosemary in a container, choose a container that's at least 12 inches across and 12 inches deep. Make sure there are adequate holes in the bottom for drainage. Fill the container with good quality potting soil or top soil. Transplant the seedling using the same methods as described above. Place the container in a spot that gets plenty of sun.